Patient: What’s the chance that these breast implants will leak? Me: Yup. Every breast implant - silicone gel or saline - will eventually leak and need to be replaced. All of them. Most will last between ten and twenty years. Some more, some less. But you are going to outlive your implants. I mean...you definitely want to outlive your implants. The first piece of good news is that breast implants will usually take many years to wear out and leak. The second piece of good news is that when this happens, their manufacturers cover them with very strong warranties.Here are the warranty programs of the four U.S. breast implant manufacturers - Allergan, Mentor, Sientra, and Ideal. Allergan makes an extensive line of breast implants. All of their silicone gel implants are cohesive (gummy bear). This means that the internal gel sticks to itself and doesn’t tend to migrate or leak if the implant shell is damaged. Allergan also says that its shell is state-of-the-art and very resistant to rupture. Their Natrelle Inspira silicone gel implants are available in five different profiles (heights) and three different thicknesses of gel. All of their silicone gel implants are available with either smooth or textured shells. They also make a line of anatomic (teardrop) silicone gel implants as well as a full array of saline filled implants. Their extensive catalog gives your surgeon huge range of choices to use in designing your new breasts. Allergan calls their warranty the ConfidencePlus Program. All Allergan breast implant patients are automatically enrolled into this warranty. Allergan silicone gel breast implants are covered for rupture, capsular contracture, late seroma, and ALCL. If you experience any of these, Allergan will replace the affected implant and the one on the other side for life. If any of these events occur in the first 10 years after your surgery, they will reimburse you for expenses up to $3500 for rupture, $2000 for capsular contracture and $7500 for ALCL. Allergan saline breast implants are covered for both rupture and ALCL. If you either of these occur, Allergan will replace both the affected implant and the implant in the opposite breast for life. There is no financial assistance for rupture unless you upgrade your warrant to what they call ConfidencePlus Premier. This must be done within 45 days of your surgery and costs $200. With the upgrade, they will reimburse $2400 of rupture expenses within the first 10 years after surgery. Allergan saline implants are not covered for either capsular contractor or late seroma formation. Their coverage for ALCL is the same as for silicone gel implants. Mentor, a division of Johnson & Johnson, manufactures two lines of silicone gel implants. Their MemoryShape breast implants are anatomically (teardrop) shaped. They come in six different combinations of height and projection - each of these come in a variety of sizes. All MemoryShape implant are textured. Mentor reports that the teardrop shape and the dense cohesive gel they use in their MemoryShape breast implants allows them to better shape the patient's breasts and achieve a natural upper breast slope. Mentor’s MemoryGel breast implants are similar to their MemoryShape line but are rounded and not teardrop-shaped. They come in four profiles and two grades of gel (MemoryGel and MemoryGel extra). All are available with either smooth or textured shells and all use cohesive gel. MemoryShape and MemoryGel implants both come with the same warranty options. The MentorPromise Protection Plan is the standard warranty and all patients are automatically enrolled in it. If, at any time, you experience a rupture of one of these implants, Mentor will provide you with a replacement implant as well as an additional implant for the other side at no charge. This part of the warranty is good for your lifetime. If the leak occurs within the first 10 years after surgery, Mentor will pay up to $3,500 of surgical costs. This warranty does not cover capsular contracture, double capsule, late seromas, or ALCL. Within 45 days of your surgery, you may also purchase the MentorPromise Enhanced Protection Plan for an additional $300. In addition to the coverage under the standard plan, the Enhanced Protection Plan provides up to $3,500 reimbursement for surgery for capsular contracture, double capsule, and late seromas. With this plan, you are not limited to a replacement implant of the same style and may choose any implant from their catalog. Mentor offers a line of saline-filled breast implants. These come in three different profiles and are available with smooth or textured surfaces. They also offer a line of anatomically-shaped saline breast implants. Like all anatomically shaped implants, these are only available with a textured surface. Both moderate and high profile versions are available. Finally, their spectrum adjustable saline breast implant allows your surgeon to change the size of your implants for up to six months following your procedure. Mentor offers two different warranty programs for their saline breast implants. Their standard warranty, MentorPromise, is the one that patients are automatically enrolled in. This offers lifetime coverage for implant rupture and will provide you with up to two replacement breast implants of the same style. There is no reimbursement for surgery costs and no coverage for anything other than deflation. That means that capsular contracture, late seroma, and ALCL are not covered. Mentor’s MentorPromise Enhanced Protection Plan can be purchased within 45 days of surgery for $200. It is the same as the basic protection plan but will reimburse up to $2,400 for surgery costs in the event of a deflation. Sientra, the third largest manufacturer of breast implants in the U.S., offers their OPUS line of silicone gel breast implants. All Sientra implants are filled with what they call their High Strength Cohesive silicone gel. They believe that this gel allows the implant to hold its shape without feeling too firm. Sientra silicone gel comes in two thicknesses HSC and HSC+. 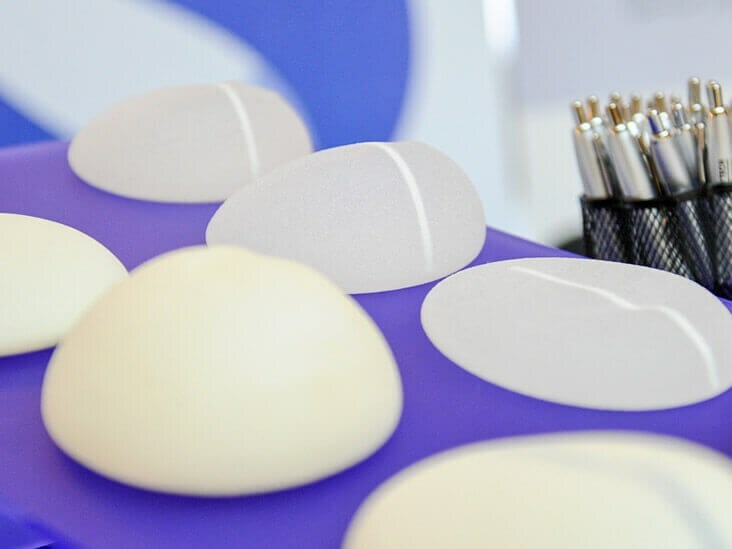 Their round implants come with either smooth or textured surfaces; shaped implants are only available with a textured surface and come in three different base shapes and a wide variety of sizes. Sientra offers a smaller range of styles and sizes of breast implants compared with Allergan or Mentor. Like Allergan and Mentor, Sientra offers free lifetime replacement for ruptured silicone gel implants. They cover both the ruptured one and provide an additional implant for the opposite breast. You may choose any of their styles or sizes for your replacement implant. They will also pay up to $5,000 in surgical fees for ruptures that occur within the first 20 years of surgery. This is the longest duration and the most money offered by any manufacturer’s warranty. For capsular contracture, late seroma, and double capsule, Sientra provides free replacement implants for 20 years and will reimburse up to $2,000 in surgical fees for two years after the date of the original surgery. Sientra does not offer saline-filled breast implants. Ideal only makes saline-filled implants. Their product, the Ideal Implant, is a clever multi-layer saline implant that is designed to feel more natural and more like a silicone gel implant than regular saline implants do. The Ideal implant contains two separate chambers that hold the saline and these are separated by multiple nested shells. Small openings in the shells restrict the flow of saline in the implant. This makes the implant feel less watery and more like silicone gel. The Ideal implant does not feel as natural as a silicone gel implant but it is definitely an improvement over standard saline implants. Ideal offers two different warranties - Basic and Premium. Both offer lifetime implant replacement for deflation and 10 years of implant replacement for capsular contracture. The basic warranty will reimburse you up to $3,500 towards surgical costs if the implant deflates within the first 10 years. There is no financial reimbursement for capsular contracture. The premium warranty offers unique coverage: it will reimburse you up to $10,000 for what Ideal refers to as postoperative events in the first 60 days after surgery. These would include bleeding, infection, anesthesia issues, blood clots, and wound healing problems. No other implant offers similar coverage. The premium warranty will also payyou up to $5,000 for deflation, capsular contracture, scarring, or other postoperative events for life. The premium warranty needs to be purchased prior to your surgery and costs $189 for primary breast augmentation and $249 for implant exchange. This warranty requires annual renewal at a fee of $79 per year. The most likely warranty scenario you will encounter is an leaking breast implant 10 years or more after your breast augmentation. In this situation, all four manufacturer's standard warranties will provide you with a replacement implant plus an additional one if needed, for the other breast. All four manufacturers provide similar financial support for implant deflations that occur within the first 10 years. Sientra offers coverage to 20 years, which is twice as long as their competitors. This could prove valuable since most ruptures will probably occur between 10 to 20 years after surgery. Offsetting this though, Sientra has a less expensive product line and shorter track record in the U.S. than Allergan or Mentor. Coverage for capsule contracture is a nice bonus but not nearly as critical as warranty against deflation. With enough time, every breast implant will eventually deflate. Very few, however, ever develop a capsular contraction. When available, consider purchasing any upgraded or extended breast warranty. The coverage that they provide will likely prove more valuable to you than the relatively low cost of the upgrade. The Ideal Breast Implant definitely offers the longest and most extensive warranty available in the industry. If you are interested in the Ideal Implant or in saline implants in general, this should be a factor in your decision. Keep in mind, though, that the Ideal Implant is more expensive than competing implants and, to obtain the lifetime benefits, you will need to remember to pay the annual renewal fee. Finally, each of these manufacturers warranties is very strong. All of them provide a level of coverage and protection that is unusual in any product, particularly one that receives as much wear-and-tear as a breast implant. While each has its pros and cons, I don't think that any one of them is really vastly better than the others. So, I would not recommend choosing an implant brand based on warranty alone. The breast implant brand used for your surgery should be discussed in detail with your plastic surgeon and ought to be based on a variety of factors including your own specific needs.